This article applies to Windows XP running on VMware Workstation 6.5.1 but the information can be applied to other guest operating system such as Windows 2000 and other the other products in VMware family. VMware Workstation provides an ideal solution for testing new applications or operating systems at work or even home. When a software company releases a new application, it tests it against all supported operating systems. In the past they used to have at least one physical computer for each operating system or combination of operating system and other software (Windows 2000, Windows XP Home with IE6, Windows XP Home with IE7, Windows XP Professional, etc). Resetting all these computers to the original configuration for a new set of tests was difficult and required many IT resources. Nowadays, in almost all software fields, the testing computers where replaced with virtual machines. Virtual machines are easier to deploy and maintain. Home users usually take advantage of virtualization technology in various ways. Geeks use it for testing or running different OS simultaneous (eg. running Linux on top of Windows) without doing any change or interfering in any way with the host operating system. Other users use virtualization for setting up a secure environment in which they can browse unsafe sites or test new software without trashing the host OS. Since VMware Workstation virtualizes the hardware itself, the guest OS is completely isolated of the host OS without any interaction whatsoever. VMware Workstation provides 2 major disk types that can be used by guest virtual machines: IDE and SCSI. If you choose SCSI, you’ll have to decide between LSI Logic and BusLogic. A detailed comparation of these 2 SCSI devices is found on VMware website. Please note that this is independent of your host hardware. You don’t need to have SCSI on your host to select SCSI for virtual machines. VMware implementation for SCSI offers better I/O performance with less CPU resources utilized. In regard to SCSI, usually people prefer LSI Logic over BusLogic. Anyway, if you try to create a new machine for hosting Windows XP, you’ll notice that VMware workstation wizard recommends you to use an IDE virtual harddrive for installing the guest operating system. The recommendation is not the same if you try to install Windows 2003 server as a guest. The reason is that, even if LSI Logic SCSI virtual harddrive offers better performance, Windows XP doesn’t has drivers for this type of device. Usually people that read this article, they already have existing Windows XP virtual machines. They just want to improve the I/O performance without spending too much time required by a full guest OS reinstallation. First check using VMware VM configuration tool if you virtual machine uses IDE harddrives. If this is the case then follow the next instructions. If you already have SCSI devices, but Bus Logic, then you can still use these instructions but you can skip the step with cloning the harddrive. Add a new hardware to the virtual machine: a SCSI drive of size at least equal to the IDE drive you want to replace. Do not remove the older drive. Using notepad, edit the .vmx file and look for a line that looks like: scsi0.virtualDev = "vmxlsilogic" (you may have a different number instead of 0). If you don’t find that line, then add it (eg. after scsi0.present = "TRUE"). Power the virtual machine and log into guest Windows OS. Windows will tell you that a new device was detected and prompts you to install drivers for it. 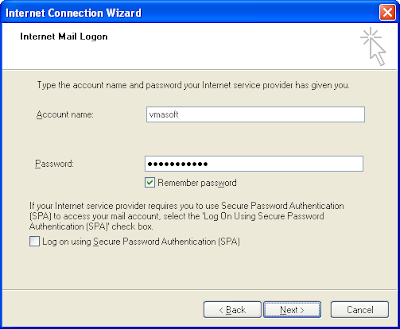 Go to http://www.lsilogic.com and look for the LSI20320 SCSI adapter driver for Windows XP. Make sure you download the drivers for Windows, and not the drivers that you use during Windows installation (eg the WHQL 1.20.18.00 package should be fine). Extract the drivers somewhere in the guest OS and install them. If everything was correctly done, the guest Windows XP OS should be able to see the SCSI disk in Disk Manager tool. Download Clonezilla live CD image. If you prefer you can use other cloning tools (eg. Ghost). Edit virtual machine properties and make the virtual CDROM use the the Clonezilla CD image. Boot the virtual machine and quickly press Esc or F2 in order to access the boot menu of the virtual system. Select from here the CD as the first boot device. Once Clonezilla is loaded, go and issue a disk – to – disk clone operation: from the older IDE drive to the newly attached SCSI. Wait until cloning is finished. Power off the machine and edit the configuration. Remove the IDE drive, leaving only the SCSI one and also dissociate the Clonezilla ISO from the virtual CDROM. Create a new virtual machine with LSI Logic controller and SCSI drives. Make sure you attach also a virtual floppy drive. 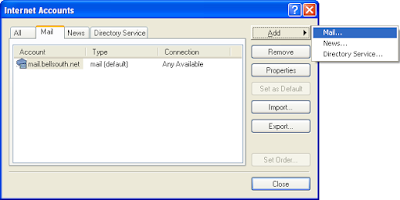 Download LSI Logic drivers from http://www.lsilogic.com (look for the LSI20320 SCSI adapter driver for Windows XP). Make sure you download the drivers that are used during Windows XP installation. If the physical computer has a floppy drive or you have an USB one, just extract the drivers on a blank floppy, otherwise use a program such as WinImage to create a floppy image (.flp) where you’ll inject the unzipped downloaded drivers. If you don’t have WinImage, you can put the drivers on a .flp image from other virtual machine. 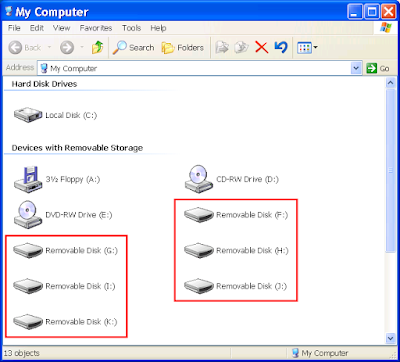 Associate the virtual floppy drive with either physical drive or the .flp image. Power on the virtual machine and proceed to install Windows XP from the CD. Make sure the virtual machine boots from the CD and not from the attached floppy. On the initial blue setup screens, when prompted, press F6 to select additional SCSI drivers. Select the LSI Logic driver and continue installation normally. This list includes some of the most useful and less known commands that you can run at Windows command prompt. This command is useful if you quickly need a file of a certain size. The command execution is instantaneous (no matter what you put for length), but the file contains only zeros. A hardlink is useful when you want to make the same file appear in different folders. Even if you can see it in many places on your drive, the hard drive space is allocated for only one instance. 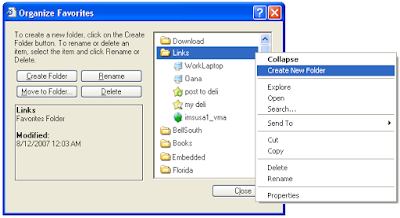 The file is physically deleted when the last hardlink is removed. The command is very useful for testing installation kits or running a CD from a folder. 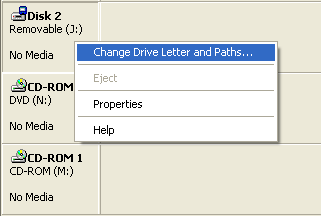 It basically creates a new drive letter that points to the indicated folder. This command is useful to check if two files are identical. Checking only the file sizes is not enough since the content may be different. The fc command, with /b switch, compares the files in binary mode and tells if they are identical or not. If you want to search also in the subfolders, add the /s switch in the above command line. This command can be used to concatenate both text and binary files. When a machine (internal server, web site, etc) doesn’t respond from the regular application, try to open a command prompt and ping that machine. Ping can be also used to find the IP behind a web address. If you are using a DHCP server in your network, then you can use this command to check the IP address leased to your computer. You can lock your workstation by running this command. You can use this command to automate the process of computer shutdown. Some prefer to put it as a link on the desktop. Kids and elderly people are two categories of cell phones users that are not getting too much support from cell phone manufacturers or service providers. Fortunately, for those living in US there are two promising services for kids. 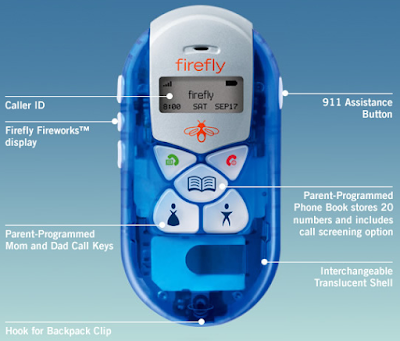 FireFly is a cell phone specially designed for kids. It is supposed to offer kids a way to make emergency calls to 911, their parents or other few persons. The phone lacks the regular keypad, so the calls are limited only to those people in the predefined list. More than that, parents may setup it is such way that only the calls from the people in the address book will ring the phone. Kajeet targets bigger kids. Kajeet offer kids modern cell phones with wallpapers, ring tones, games, etc., while the parents enjoy prepaid like benefits. Parents can define the time schedule when the phone can or can’t be used or decide who can call and who cannot call the kid. While the above are nice, the most interesting feature is the wallets concept: a wallet for parents and a wallet for the kid. Parents decide whose wallet pays for what calls. For instance parent’s wallet pays when the kid calls them, while kid’s wallet pays when the kid calls his friends. In this way there is no risk that you’ll not be able to contact your kid because he consumed all the credit on text messages with his buddies. For a limited time only you have the chance to advertise your products and services for free on VMA IT Observer. Only IT/Communication (software, hardware, VoIP/Skype, IT services, etc.) related advertisements allowed. Write yourself a review/ presentation of your product or service. This will be published like a regular post of VMA IT Observer. Since this is an advertisement, it’s understandable that you’ll be subjective in your review and you’ll highlight your product/service’s features. This is OK with VMA IT Observer as long as the writing appeals to a large number of people. VMA IT Observer will check each review/presentation before publish and reserves the right to accept or deny posting. 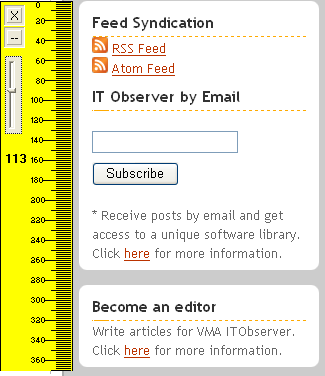 From case to case, VMA IT Observer may include a small note in each advertisement post to inform the readers that the post is an advertisement. 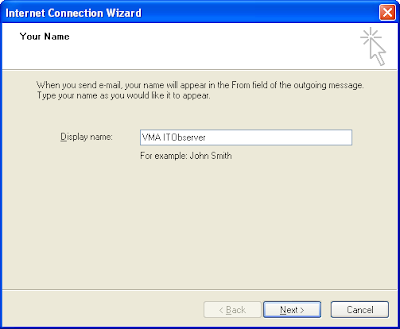 You can now place your own advertisement/ banner on VMA IT Observer for free. Only text and image advertisements are allowed. For image advertisements you should take care yourself of image hosting. For image advertisements you may include a link that drives customers to your site. At this moment advertisements are allowed only on the right side of the page. These may appear only on the first page or on all site pages. VMA IT Observer must approve advertisements prior to publishing. If you are interested in this exceptional offer please contact VMA IT Observer by email at vmasoft @ yahoo.com Please mention IT Observer in the email subject. - VMA IT Observer reserves the right to discontinue at any time this service, or to change publishing rules. - VMA IT Observer reserves the right to inspect and deny advertisements. - VMA IT Observer reserves the right to remove at any time, without any notification, published advertisements. - Each advertiser is responsible of the published content. VMA IT Observer doesn’t endorse any advertisement review, or can be made responsible of published content. - VMA IT Observer cannot be made responsible of reader’s comments. This is good news for software developers. 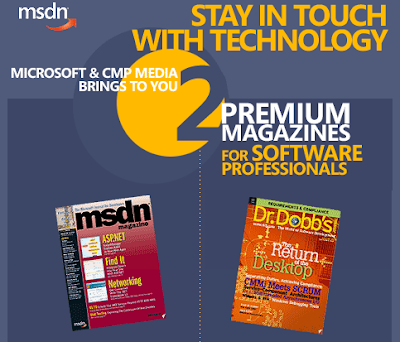 You can not get both Dr. Dobbs Journal and MSDN Magazine (digital editions) for free. Just follow this link to complete your subscription. Let’s suppose that you don’t have a long distance phone plan and you want to call a friend out of state…. This is as simple as visiting viatalkfree.com website and initiate the phone call. Since the website requires entering two US numbers, both you and your fried have to be in US. Anyway, with a little effort you can call your friends in US even if you are living in Europe. All you have to do is to obtain a free US DID number ahead of time. For alternatives ways of calling for free US numbers, check also this post. your cell phone. You may be charged by your provider. by using email to SMS. Read this post for more information. by using T-Mobile’s online tool available at this address. Most people don’t know that you can deliver a voice mail directly to the inbox of the other party, without making the phone ring. The recipient will usually be notified on the screen or through a short beep of any new received voice mail. Step 1. Dial 1-805-MESSAGE. This is the same phone number that you can use to check your voice messages – as explained in this post. Step 3. At the prompt speak your message and then hang-up. Step 1. Dial 1-805-MESSAGE (1-805-637-7243) from any landline. Step 4. When prompted, enter your password. 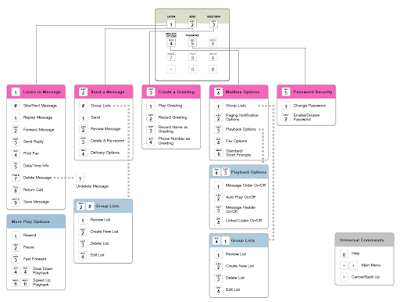 For a visual representation of T-Mobile VoiceMail shortcuts please refer to the following PDF diagram. This tip works with both postpaid and prepaid accounts. Most probably your cell phone provider offers you a pretty basic (dump) voicemail feature. To listen to your voicemails you have to dial a number and check all messages one by one. The trick consists in conditional forwarding (if you don’t answer, you’re busy or unreachable) your calls to a free GrandCentral number. Step 1. Create a free GrandCentral account (GrandCentral was briefly presented in this post) and do basic settings. Do not define any phone numbers since you want the voicemail to handle all incoming calls. Don’t worry! You don’t have to change your phone number! Your GrandCentral number will remain hidden behind the scene, while you’ll continue using your regular cell phone number. People will not even know about this little trick of yours. Step 2. This step is optional but important if you wish to go back to your old voicemail system. Check with your cell phone provider the current status of conditional forwarding and voice mailbox number. Normally all three should be forwarded to the same number. Step 3. Activate/Change conditional call forwarding feature for your cell phone. For all other wireless carriers, is recommended to contact them to check this information. Note: Using the same technique, you can even skip your company PBX voicemail system altogether and forward your business phone number to GrandCentral. 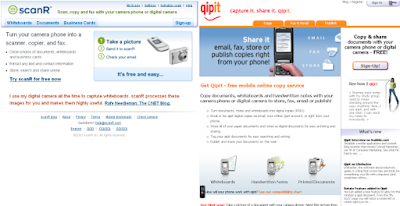 Two new services (scanR and qipit) are helping you to take advantage of your cell phone camera, by giving you the convenience of converting a captured image to a PDF document while on the go. The process is pretty simple. Take a picture of a whiteboard or notebook with you cell phone camera and send it via email to one of the previous mentioned services. In couple of seconds you’ll get back a PDF version of your picture. 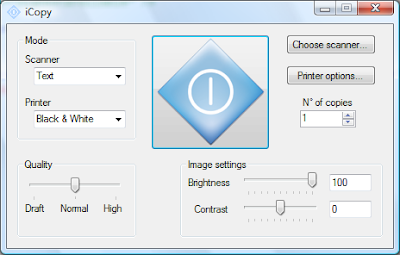 Both service clean up the picture and adjust the contrast before converting to PDF. The first one even does OCR (Optical Character Recognition) on the picture. 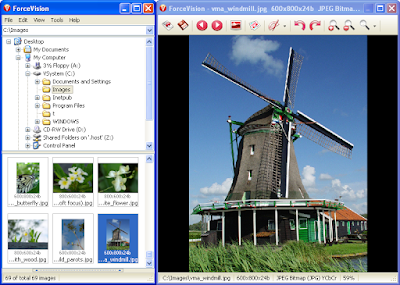 While the same thing can be achieved by downloading the pictures to a computer and turning them to PDFs using inexpensive software, these services may appeal to mobile users who don’t find the time to do this manually. You may be interested in embedding documents and information in picture files from lots of reasons, and only your imagination may find all applications. Step 4. 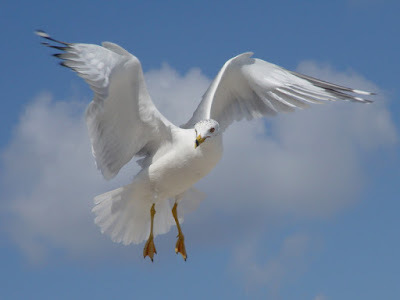 Send the new picture file by email, or post it on a web site. It’s very important to NOT process this image further using other software. Step 5. 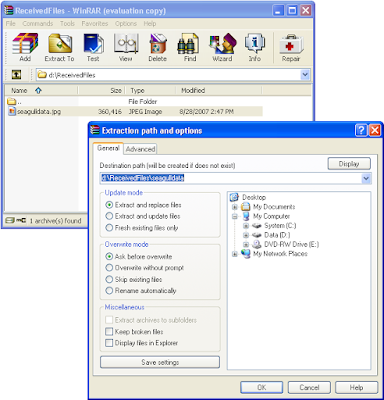 The recipient should use WinRar software to extract the documents from inside the picture. Any other software will probably see just the image information. Taskbar Organizer is allowing you to rearrange the items on your taskbar (eg. some prefer to keep their email client or file manager next to the Start button). Trayconizer allows you to make almost any application minimize to systray. All you have to do is to start this software in command line with the desired application as parameter. 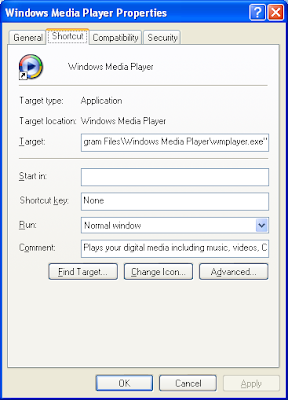 You may want to check this post that explains how to minimize Windows Media Player to systray using this tool. E-mail is still one of the most important services that the Internet is offering. No matter what other messaging and collaboration tools are out-there, email is still the number one collaboration instrument for both corporate and home users alike. This post presents two types of specialty email services, not well known by typical internet consumer. If you are receiving tons of spam because you give you email address to all sorts of websites, then is the time to look at one of these services that offer disposable email addresses. You don’t have to register, or to visit the disposable email service websites ahead of time. Just think at an email address in your head and you instantly have that address. Let’s pretend that you are filling a web form to download an interesting piece of software, when they suddenly ask your email address. Just put there testsoftware47@mailinator.com and submit the form. Next go to http://www.mailinator.com and type in the provided textbox the address you just invented. There is no need to put a password or to create an account. This is other specialty email service. It helps you in those situations when you want to keep an email private once it's been read. To achieve this, just open an account with one of the following services. In majority of situations the recipients will get an email containing a web address. The link will open a web page containing the actual message. Once opened the remote page destroys itself putting you in complete control (you’ll know who opened the messages and even you’ll be able to remove a message before is opened by the recipient). 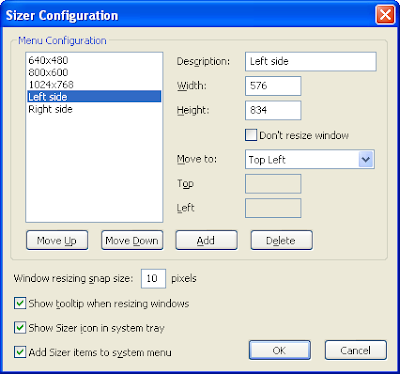 Sizer is a free tool that allows resizing any window to an exact size. According to its website, this is useful to web designers (eg. 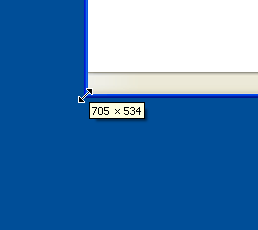 to resize the browser to different sizes) and documentation writers (to capture windows at the same size). Another usage of Sizer may be window management. Advanced users (especially those with wide screens) may find the regular Tile windows horizontally/vertically commands not power enough. With Sizer you may easily put two web browsers side by side. You don’t have to install Sizer. Just run the executable and then right click on the systray icon to configure it. Use the configuration options to create predefined resizing templates that you’ll apply at a later time on any given window. 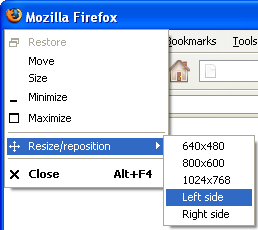 Depending on the configuration, a system menu option is inserted to facilitate the window resizing and positioning. While running the software guide you also, with a small tooltip, when you manually adjust a window. 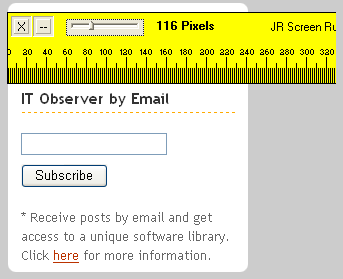 Screen ruler can display pixels, inches, centimeters or picas and can be used to measure objects on both horizontal and vertical. Lern how to get uber-cheap watch batteries from this Instructables movie. * Email subscribers: The movie appears only in the online version. 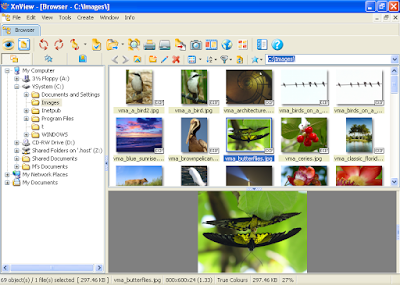 Image viewers are essential tools for all digital camera owners. They help you browse, view, categorize and print your digital photos in an easy way. Keep in mind that their functionality is oriented on photo management/viewing not photo editing. Supports an impressive number of file formats and is highly customizable. Has lossless JPEG operations (rotate, flip). Can send photos by email (with automatic resizing). 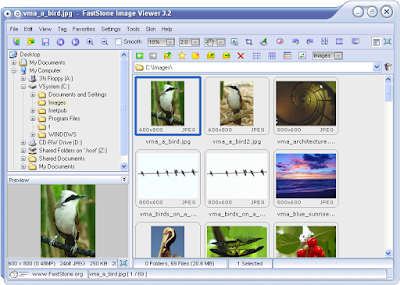 While doesn’t support as many format as XnView, FastStone is more polished. Has a very simple but effective UI. 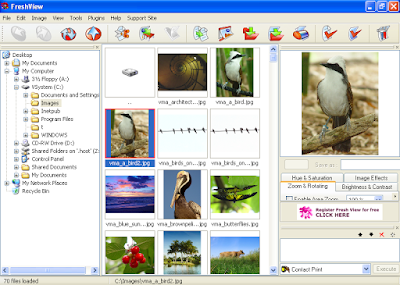 The interface has the file browser separated from the image viewer. If none of the above is on your taste, then check also IrfanView and Picasa. If you are using the computer to do online shopping or banking then you probably know those confirmation pages that you are invited to print for further reference. Most people don’t print them at all, while others are just creating piles of paper by sending those printers directly to the printer. If you are in one of above categories, take a few minutes break now and install a virtual PDF printer. Whatever you’ll send to that printer it will be saved in a PDF file on your local disk. Turning digital, not only you save the trees but you add convenience to your work. Most people associate producing PDFs with commercial software. 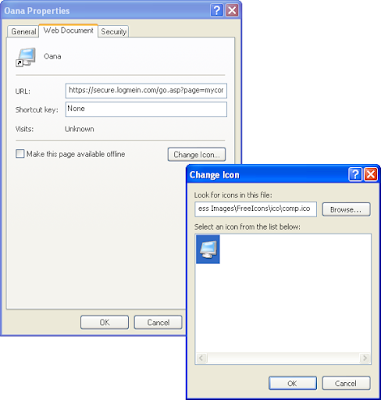 While those applications have certain advantages, you cannot ignore freeware and open source PDF creators. 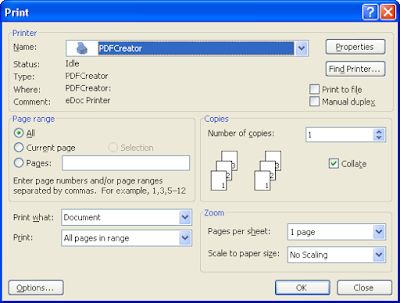 A very good virtual PDF printer is PDFCreator. 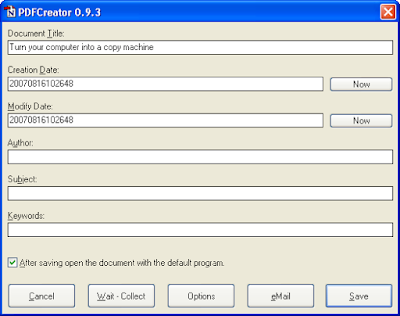 Since PDFCreator installs like a virtual printer, you can create PDFs from any program that is able to print (your web browser, email client, word processing application, etc). You can even use the PDFCreator printer as part of your copy machine, as explained in the previous post. iCopy is a free and open source software that lets you combine your scanner and printer into an easy to use photocopier by only pressing a button. Owners of all-in-one printing/scanning devices may already have this feature, but for the rest this software may look like a nice idea, especially if you have to copy frequently. CCleaner is a freeware system clean up tool. It removes browser history (Internet Explorer, FireFox, Opera, Safari), cookies, temporary files, MRU lists, log files and other unused files from your system in one single step. Yahoo doesn’t offer anymore free POP3 access to your Yahoo mailbox. Hundreds or even thousands of your important emails remained trapped on their servers. 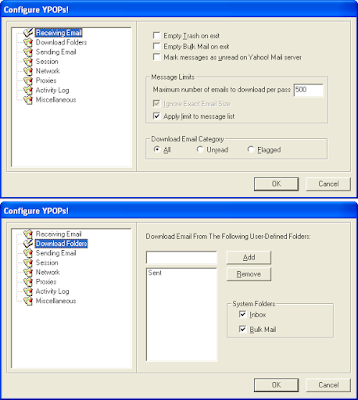 Fortunately, there is a quick and easy solution to download all those emails into Outlook Express (or any other local mail client). Step 1. Download YPOPs!. 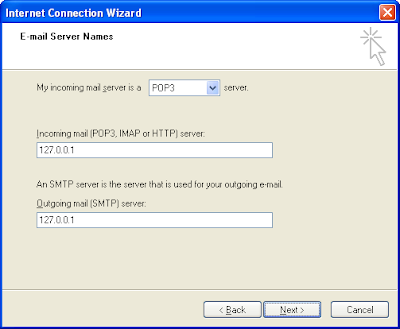 This is an application which emulates a POP3/SMTP mail server and provides free POP3 and SMTP access to Yahoo! Mail. 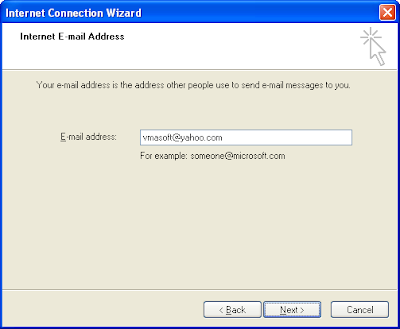 It does not depend on Yahoo's POP3/SMTP mail server. Step 2. Install downloaded application and take a look at its settings. Normally you don’t have too much to configure here. Step 4. 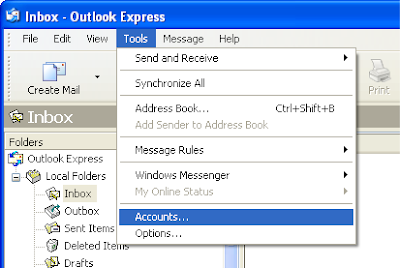 In the window that opens, click the Add button to add a new mail account. Depending on your configuration you may already have some predefined accounts. Step 7. 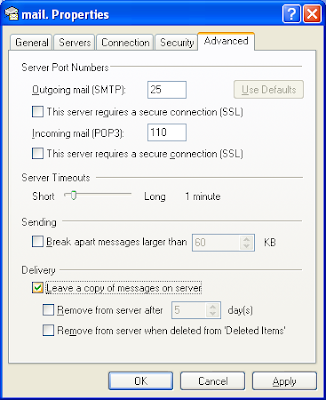 Specify 127.0.0.1 as your POP3 and SMTP server. This is your local address where YPOPS application is installed. 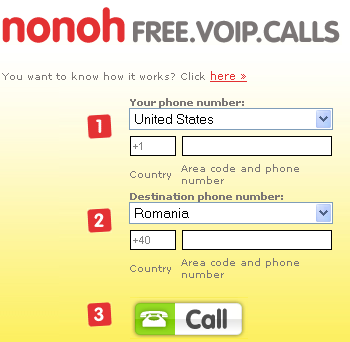 The new nonoh service has a deal to call Romania, and other destinations, for FREE. The service wants to compete with Jajah, by offering much lower prices. nonoh is a service of Betamax. For more offers of FREE calls to Romania, check also this post. Since digital cameras proliferation, all PC manufacturers started to include media card readers in their new PCs. If this looks like a useful addition to you, you’ll actually discover pretty soon that you don’t use those readers at all. Like this wasn’t enough, even monitors come now with media readers built in. 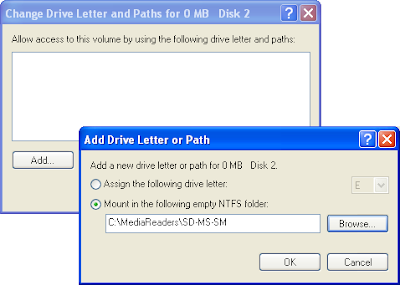 All these media readers contribute to the drive letters clutter in your computer. The below image was captured from a modern Dell computer. To solve this issue, will use the ability of modern Windows OSs to mount drives in folders (instead of assigning letters). Step 1. Create a folder for each media read you have in your computer / monitor. Step 2. 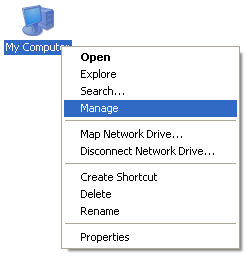 Right-click on My Computer icon (located on the desktop) and select Manage. Step 3. 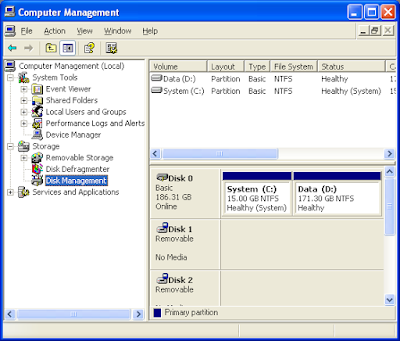 Computer Management opens. Locate here Disk Management. Step 5. Remove default letter and select one of the folders you created at step 1. 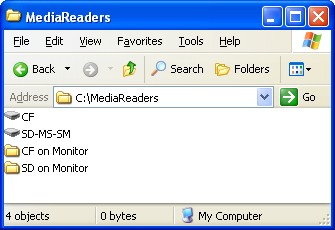 From now on, when you’ll want to access a media-reader you’ll just navigate to the corresponding folder. No more drive letters and/or clutter. 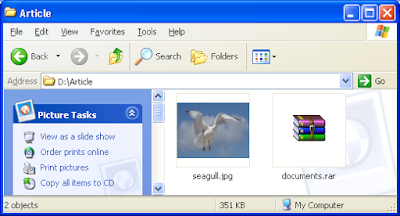 Systray, or System tray, is a special Windows region, located generally at the bottom right-hand-side of the screen. Time and Volume control icon are usually displayed there. 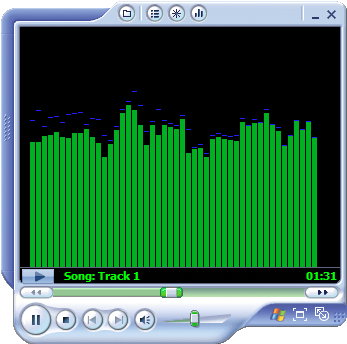 Windows Media Player (WMP) comes preinstalled with each Windows system. Some love it, others hate it. Anyway WMP doesn’t have the ability to minimize itself to systray. To minimize WMP to systray just follow these steps. Step 1. Download the free Trayconizer.exe application from this site. After downloading install the application. Step 3. 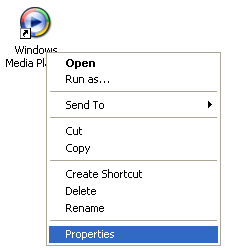 Locate WMP icon and select properties. 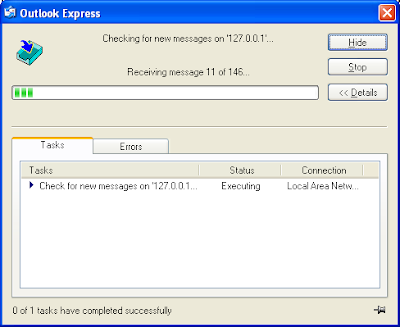 ... and then paste at the beginning of Target textbox the text copied at step 2. "C:\Program Files\Trayconizer\Trayconizer.exe" "C:\Program Files\Windows Media Player\wmplayer.exe"
That’s all! Next time start Windows Media Player from that shortcut and you’ll see that it minimize to systray. This post presented how to minimize WMP to systray, but actually you can minimize almost any application using the same technique. If you are accessing certain sites frequently, then it’s a good idea to create a custom button bar and assign a button to each site you visit. 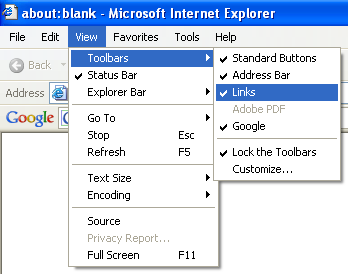 Those sites on the toolbar are now one click away! Step 2. Next time, when you visit an interesting site, just drag and drop the icon in the browser address bar to your custom button bar. Step 3. Create menus. If you don’t have space anymore on the toolbar, then you can group several buttons using a menu. Menus are actually subfolders of Links folder. You can create them easily using Organize Favorites command. Step 4. Customize icons. This step is optional but contributes to the aesthetics of your button bar. Not to mention that some people recognize faster a shape than a text. Note that some websites, such as del.icio.us, make use of this toolbar to implement custom tools.